On one level, Lost Ground sets itself up as a crime novel where the elements of the conventional police procedural are bound with deep echoes of the tensions and realities of the new South Africa. But in the skillful hands of Michiel Heyns it evolves into much more – a heart stopping rush headlong into a series of events that will leave its erstwhile hero irrevocably changed. It is a murder that draws Peter Jacobs, an ex-pat South African, back to his hometown of Alfredville, a sleepy little village in the Little Karoo. A freelance writer living in London, he has been away from his native soil for over 20 years. His father’s British citizenship afforded him the option to pursue studies abroad and thus avoid conscription. What finally draws him back is his writer’s sense of a good story. His own beautiful cousin Desirée has been murdered and her husband, the black police Station Commander, is under arrest. This is, Peter believes, the entry point for an examination of the complicated dynamics of post-Apartheid South Africa and, in his neatly planned agenda, a story that he imagines re-envisioning as a New Yorker friendly exposé drawing allusions to Othello. What it opens, in the end, is far more personal and devastating than he can even begin to imagine when he first returns to his hometown. It is clear from the beginning that Peter is carrying more baggage than the basic wardrobe he itemizes. James, his partner of five years, a Jamaican actor, has just broken up with him and he is not entirely certain how he feels about it. As he settles into his hotel, old locations and familiar faces naturally trigger memories – of school days, childhood adventures and the awkward fumbling of youth. Then, he discovers that his best friend Bennie is also back in Alfredville. He is now a police officer, temporarily the acting Station Commander, and married with two children. Their reunion is awkward and tentative at first but it slowly warms, reawakening a flood of memories of a past that Peter believed he had, with time and distance, left behind. A wide range of colourful characters and personalities pass through the pages, described with the precise care and attention befitting his detail oriented writer narrator. Some are ghosts from Peter’s past, others, like the elegant black female psychologist who becomes his challenger and confidant and the handsome vet who seems to have cast a spell over the bored housewives of Alfredville are either new or passing through. But it is the nostalgic revisiting of his youth, inseparable from the memories of his friendship with Bennie, that anchors the novel, creating the emotional texture and complexities that will ultimately leave the reader gasping for breath as the end nears. This was, for me, my first read following a significant health scare. It was everything that I could have hoped for at this moment – a smart, well written and tightly paced story woven with literary allusions, significant observations about the current state of South Africa, telling observations about the risks inherent in returning to the past and an unobtrusive but entertaining gay subtext. By turns humorous, heart breaking and dark it was the perfect prescription. 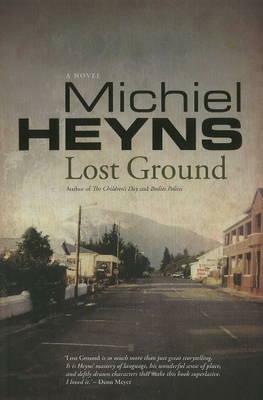 * Published by Jonathan Ball, Lost Ground is one of Michiel Heyns’ books that is fairly easy to access outside of South Africa, at least through special order distributors. This sounds intriguing, I enjoy crime novels that are rooted in the social and political landscape. I do hope you are feeling well…. It is difficult for South African writers to avoid the political context. This novel works on many levels – political, social and personal. Same here in Northern Ireland. Thanks Penny. This is such a solidly strong and entertaining novel I found it hard to write about it without unraveling too much of the plot. It is really a journey that the reader has to take with Peter through to the end. You did well. No spoilers but a nice hint. I also battle with that in my reviews – making sure I don’t give too much away. Reblogged this on 2015 Reading Challenge – SA books only.